If you have any questions or want to enquire about dates, use our form to contact Hugh & Mary Elliott or see their website for more information. A simple redbrick stable from the outside. Inside a wonderfully bright, attractive and well-finished living space (with underfloor heating). Since its animal-sheltering days, this has also been Hugh’s furniture design studio – the garden furniture is his. They have a gallery in Much Wenlock which Mary runs, and she chooses artwork to display here (which you can buy). Their conversion makes clever use of space; rooms swoop right up to the rafters. In the well kitted-out kitchen: bold black units and lime blinds. In the white living/dining room: big modern sofas and a funky orange armchair by the wood-burning stove, a re-visited 60s dining set, books, games, and French doors onto the veranda. The larger bedroom also has doors straight out; both have king-sized beds, restful colours, well-designed cupboards, lighting and linen. The bathroom has a bath and shower and plenty of natural light from above. 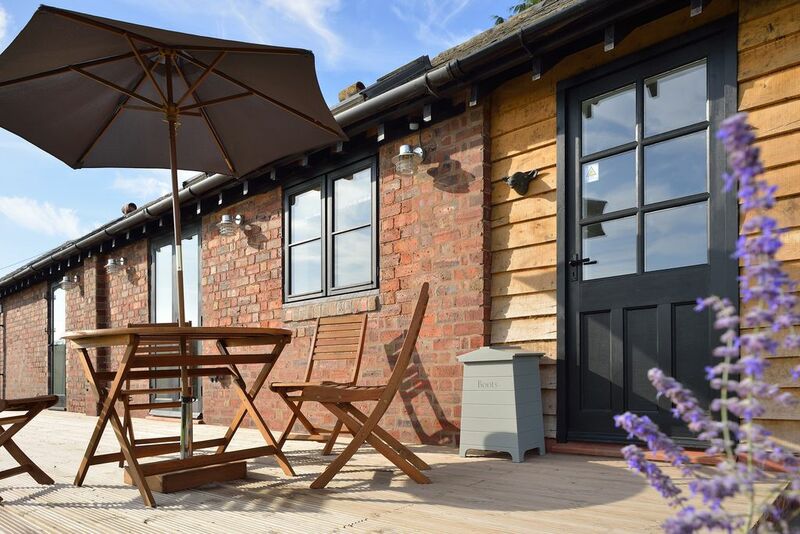 The friendly Elliotts live next door but you’re not overlooked and views are of rolling Shropshire countryside and the Wrekin; this is good hiking and biking territory (with storage), 15 minutes’ drive from Shrewsbury. Minimum stay: 3 nights. Not suitable for children or pets. Very comfortable and well equipped accommodation. Off the beaten track but access quite easy. Lots to see and do within a 30 minute drive, we discovered parts of Shropshire we had never been to before. Lovely accommodation. Comfy with great views and the only the sound of birds in the mornings. Great countryside for walking- Long Mynd and Wenlock Edge. Very relaxing holiday. Absolutely stunning place to stay. The decor inside is amazing, the kitchen is as well stocked with gadgets as my kitchen at home, the living area was made for sitting and chatting in and the beds were a delight! Then outisde is a truely beautiful view with the perfect little deck and garden! If you're after a super lively cottage in the thick of things then this isn't the place for you! We loved how peaceful it was and I honestly don't think you could ask for more from a holiday cottage! The Shippen is a really lovely place to stay. Beautifully designed and furnished, with much attention to detail. The location was quiet, yet close to Shrewsbury and many interesting places to visit nearby. We loved the space and the big skies. Thank you to Mary and Hugh for a marvellous week. We chose The Shippen as we were attending a wedding nearby and picked a 3 day visit but really wish we'd booked for a full week as the time flew by and we ran out of time to take in everything the area has to offer. The Shippen is vastly equipped with many extra touches (scones & jam and tea/coffee provisions) and we wanted for nothing. The bathroom towels are luxuriously soft and the beds a dream. We enjoyed a BBQ and Sunday roast during our stay as well as breakfast al fresco in blazing sunshine. Also loved listening to Absolute on the digital radio and the Wifi coped with our many devices. You are in the tranquil Shropshire countryside yet only 15 minutes from Shrewsbury. The towns of Much Wenlock and historic Ironbridge are 20 minutes away and its also a great base for walking in the Shropshire Hills, Wenlock Edge and the Long Mynd. Sitting quietly on the veranda when the House Martins are nesting is just magical as they swoop past just inches away. In winter you may hear the evocative cry of the Curlew and in early summertime even an Osprey has been spotted on its journey north. The Shippen is doing it's bit to help the environment with underfloor heating and hot water provided by renewable energy air-source heat pump technology. The Shippen is a wonderful quiet rural retreat for grown ups - sorry no children or pets but assistance dogs are always accommodated. We have a charging point for electric and chargeable hybrid cars.